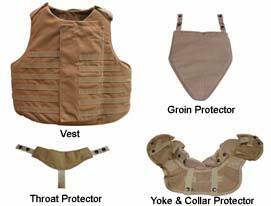 The base vest consists of a back panel, front right panel and front left panel. Each panel consists of a removable ballistic insert and an outershell component. The front panels are connected to the back panel with three pieces of nylon webbing at each side (two outside side adjustment straps and an inside side retention strap) and are also attached at the shoulders. After donning the vest, the front panels are secured using hook and loop fastener tape and snap fasteners. The back panel has a SAPI pocket at the top that can be accessed while the vest is worn. The front right panel has a SAPI pocket that can also be accessed while the vest is worn. The front SAPI pocket has an eject strap that allows the user to quickly eject the hard armor protective insert. The fit of the vest is adjusted using the nylon webbing at each side of the vest. The vest has PALS webbing located on both the front and back panels.